Nobel Winner Dies 3 Days Before Prize Announced : Shots - Health News The three scientists who won this year's Nobel Prize in Physiology or Medicine opened important windows on how the immune system works to defend against microbial invaders and refrain from attacking animals' cells. The three scientists who won this year's Nobel Prize in Physiology or Medicine worked with grasshoppers, fruit flies, mice and human cells to open important windows on how all these creatures defend themselves against microbial invaders and refrain from attacking their own cells – except when they don't. Bruce A. Beutler was the only American winner of the Nobel Prize in Physiology or Medicine this year. It's intricate and complicated stuff, but the two main concepts you need to know are: innate immunity and adaptive immunity. American Bruce Beutler and Frenchman Jules Hoffman made landmark discoveries in innate immunity — the fast, first-line defense against an invading bacterium or virus. The third laureate, Canada-born Ralph Steinman, made his mark by discovering some of the key mechanisms in adaptive immunity – a more complex and targeted defense that extends the defense against an infection and retains a memory that can be instantly activated again. But in an unusual and tragic twist, Steinman's family announced this morning that he died of cancer last Friday. Rockefeller University didn't know until this morning, and apparently neither did the Nobel Committee. 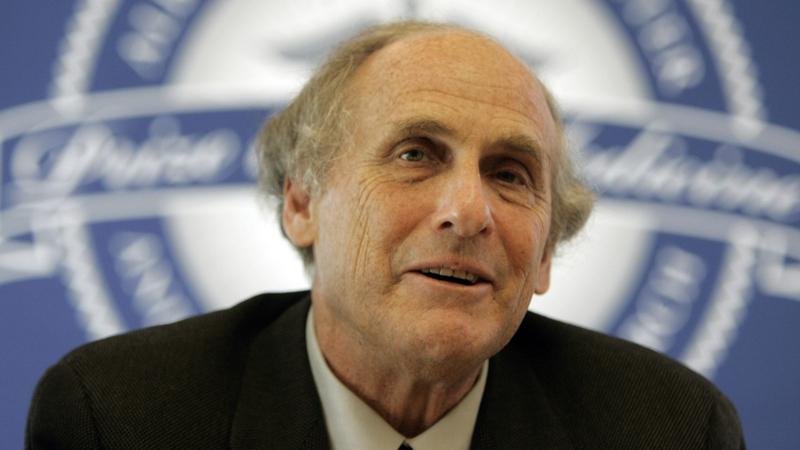 Rockefeller University said in a statement that Steinman was diagnosed with pancreatic cancer four years ago. "His life was extended using a dendritic cell-based immunotherapy of his own design," the university said. 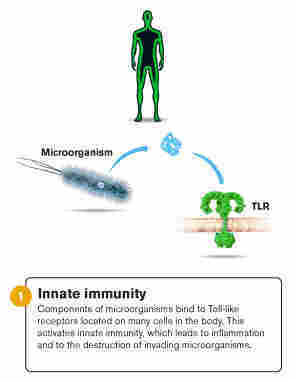 An illustration of innate immunity. Nobel Prizes are typically not awarded posthumously, but it was not yet clear what the Swedish organization will do in this case. According to the Nobel Foundation's current statutes, amended in 1974, "work produced by a person since deceased shall not be considered for an award. If, however, a prizewinner dies before he has received the prize, then the prize may be presented." That suggests the foundation will award a prize in the case of a death that has occurred after the announcement, but not in the case of a death before the announcement. 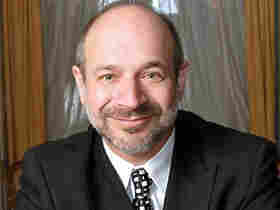 Bruce Beutler is now at the Scripps Research Institute in California but will soon take a position at the University of Texas Southwestern Medical Center in Dallas. His father was a distinguished physician-scientist who fled Nazi Germany. His mother was born in America to Ukrainian immigrants; she was a technical writer and homemaker. The Beutler household had high academic standard. Two of Bruce Beutler's siblings also became physicians while a fourth sibling is a successful software designer. "From the age of 7 or so, I wanted to be a biologist, and nothing else," Beutler writes in an autobiography last month for his acceptance of the Shaw Prize, a 9-year-old award established by a Hong Kong businessman. An illustration of adaptive immunity. He graduated from the University of California, San Diego at the age of 18. Beutler's most important discoveries were made between 1984 and 1998 when he was at the Rockefeller University in New York City and UT Southwestern. Working with mice, he discovered a molecule called tumor necrosis factor, or TNF. It's important in initiating an inflammatory response, and also devised molecules that inhibits it – advances that have relevance for a wide spectrum of infections and auto-immune diseases. Beutler tells NPR's Jon Hamilton on All Things Considered that he made one of his most important discoveries one night in 1998 after five frustrating years of research. "I saw the mutation we were after and I was absolutely thrilled," Beutler says. "I was just shaking." Beutler also discovered a receptor on mammals' cells that recognizes a molecule on many microbial cells called LPS (lipopolysaccharide). When mammalian cells detect LPS, they mount a strenuous defense – one of the first steps in so-called innate immunity. The LPS receptor is also involved in inflammatory diseases. Jules Hoffman, a scientist in Strasbourg, France, made his contributions to innate immunity by studying grasshoppers and fruit flies. His father was a high school biology teacher and an ardent insect collector. When Hoffman began his career, almost nothing was known about how insects defended themselves against infection. His work established that the immune systems of insects and mammals — including humans — share many common mechanisms, especially in the way they respond initially to microbial attack. Ralph Steinman received his undergraduate degree at McGill University in Montreal but took his medical training at Harvard and has done most of his important work at Rockefeller. Steinman's focus on the dendritic cell showed how these immune sentries capture invading bacteria and viruses and disarm them. Then these dendritic cells display pieces of these captured invaders on their own surface – as if to say "Attack this!" That touches off a complicated immune response exquisitely adapted to those particular invaders – thus the term "adaptive immunity." Steinman also showed that dendritic cells, while they're not dealing with infections, capture "self" cells and environmental proteins as part of a lifelong process of discriminating between dangerous and harmless. Understanding why this system goes awry is key to understanding autoimmune disorders such as diabetes, arthritis, lupus and multiple sclerosis. The Nobel Foundation called the death of Ralph Steinman just days before the announcement of his Nobel Prize "unprecedented," and said he would remain a Laureate. "The decision to award the Nobel Prize to Ralph Steinman was made in good faith, based on the assumption that the Nobel Laureate was alive." The committee's decision, thus, "remains unchanged."